If you are like me who have accumulated thousands of audio, movies, and other files over the years, it is not unusual to have tons and tons of duplicate contents that are scattered throughout the hard drive. Even though our storage devices are getting bigger, those duplicate files are still a waste of space. So what should you do with them? Should you manually find those files and clean them up one by one. Well, that's not necessary because there's a good utility that can help you in searching and cleaning duplicate files and more. The program that you will have to install is called FsLint (Filesystem Lint). It has both a GUI as well as a command line interface. 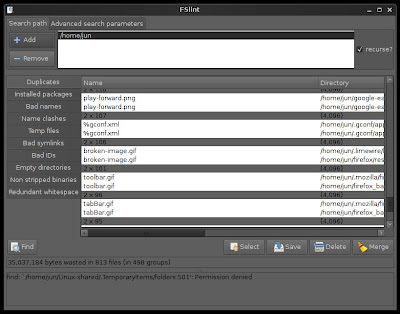 Aside from finding duplicate files, FsLint is also capable of searching for problematic filenames, temporary files, bad symlinks, empty directories and non-stripped binaries. So let me show you how to install and use FsLint. After installing FsLint, you can find it at Applications-->System Tools-->FsLint. FsLint has a simple GUI. By default, the search path is your home directory but you can add other directories or use the “Advanced search parameters” as well. Once you've added the search path, simply click on the "Find" button and the program will immediately start looking for duplicate files and others mentioned above. 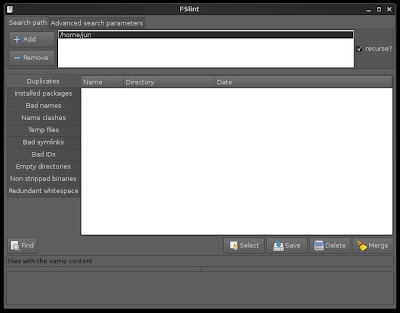 After the searching is done, the names and directories with issues are displayed. You are then given options to save, delete, or merge those duplicate files. That’s about it. Now go on and start cleaning those duplicates files. Why just Ubuntu? fslint is not a distro-specific tool. should i just delete everything fslint finds? nice tool, I like the ability to hardlink identical files! does it do a name of file comparison or a diff, that is a byte compare.